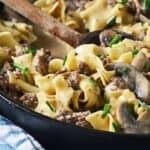 Ground Beef Stroganoff is an easy recipe ready in about 30 minutes, making it perfect for any night of the week, but also a good choice for a nice Sunday supper with the family. 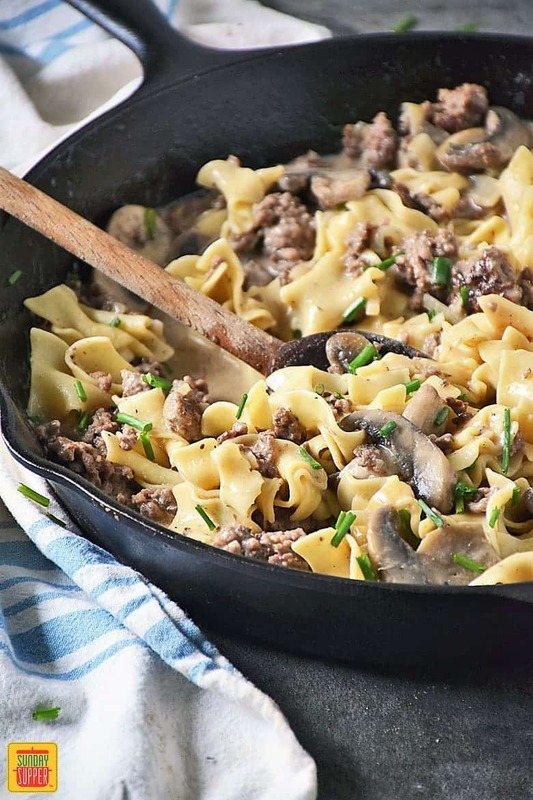 Our beef stroganoff recipe is a budget-friendly twist on the classic, substituting ground beef in place of the more traditional tender beef strips you’d find in the classic Russian recipe. Beef Stroganoff is a classic comfort food recipe that originated in Russia in the 19th century and consisted of sauteed beef strips in a bouillon and mustard sauce finished with sour cream. It was traditionally served with potatoes. 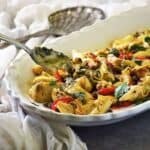 The more familiar recipe of today is served with egg noodles and has onions and mushrooms, but a quick Google search turns up many variations of this popular dish. Beef Stroganoff is so popular it was the number 1 searched recipe of 2017 according to Google! Does that surprise you? It did me, but then again when I think about how often my husband asks me to make Beef Stroganoff, it shouldn’t surprise me. 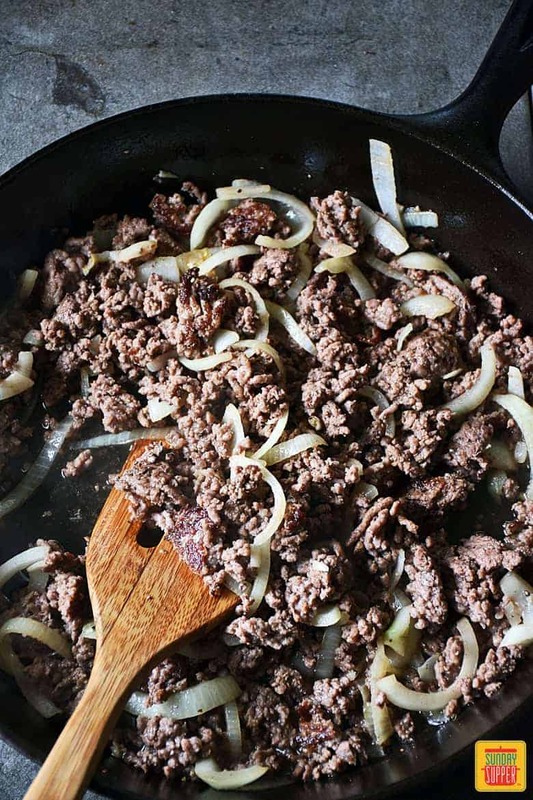 We do love the comforting goodness of traditional beef stroganoff with tender strips of beef, but I’m always looking for good ways to save money, so I decided to try my traditional recipe using ground beef. I was so pleased with the results. This Ground Beef Stroganoff is just as delicious as my traditional recipe, and the cost savings is like having your cake and eating it too! 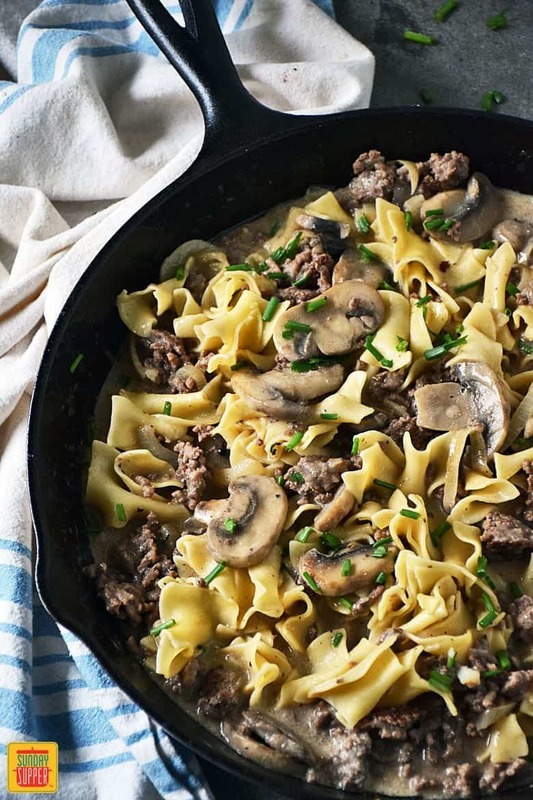 The ground beef still gives this recipe a nice beefy flavor and the texture of the ground beef made this beef stroganoff easy to enjoy. 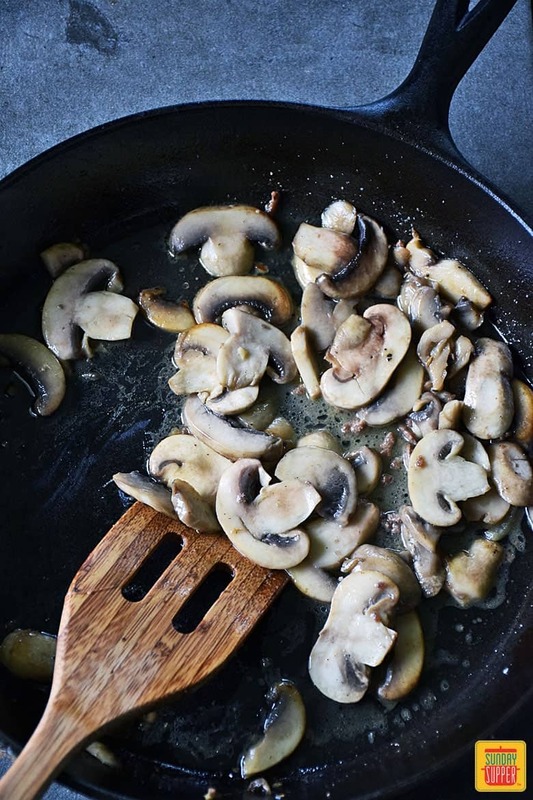 Sauteing fresh mushrooms in butter to bring out their flavor added a deep, rich savory level to the sauce you won’t get with jarred or canned mushrooms, so be sure to use fresh when possible. Don’t even think about using canned soup with this recipe. The end result just won’t measure up! 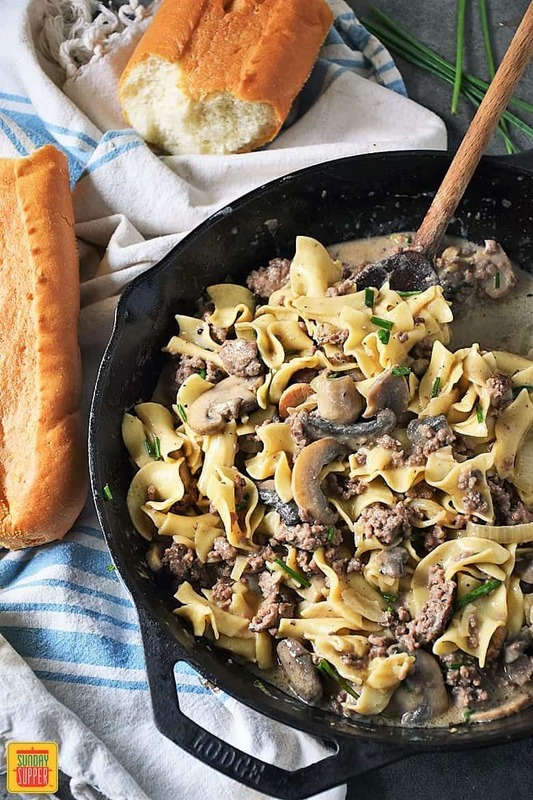 It takes just a little extra effort to make this ground beef stroganoff using fresh ingredients, but it is totally worth it! This recipe was made in just one skillet with the exception of the egg noodles. I prefer to cook the noodles separately for best results. I find trying to cook noodles with the other components of a dish doesn’t work out well, so I tend to avoid it. 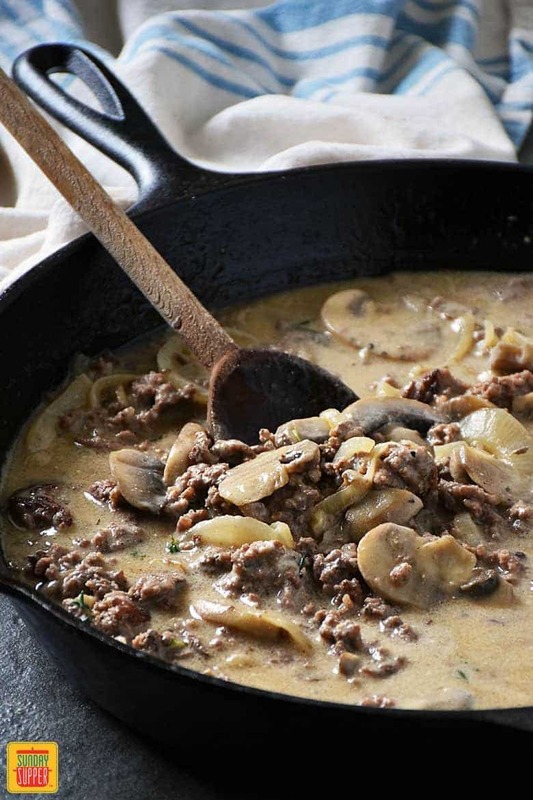 Ground Beef Stroganoff always brings the family to our Sunday Supper table! Not only is it delicious, but it’s on the table in about 30 minutes!! 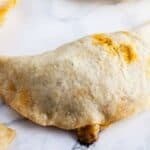 You’re going to want to make this easy recipe again and again, so be sure to add it to your list of favorite Sunday Supper Recipes! 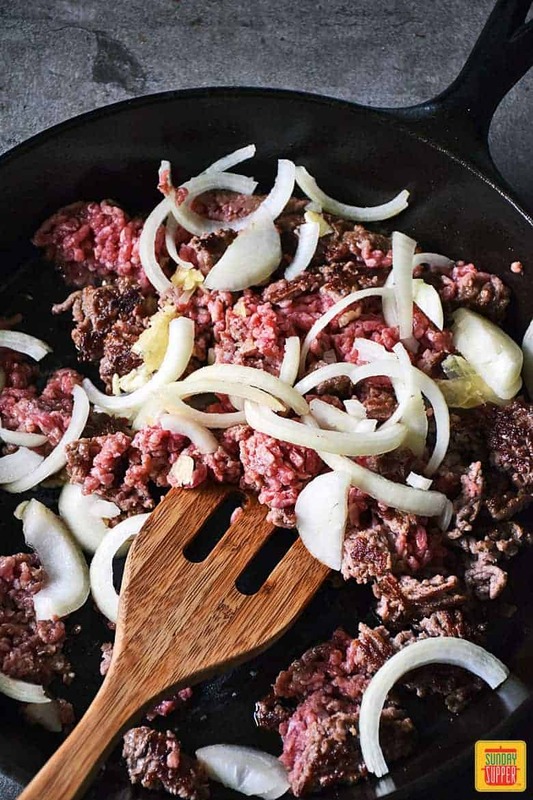 Use Certified Angus Beef® brand ground chuck for best results. 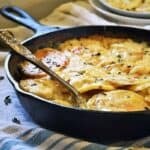 We recommend a 10″ cast iron skillet, however, a stainless steel skillet will work as well. 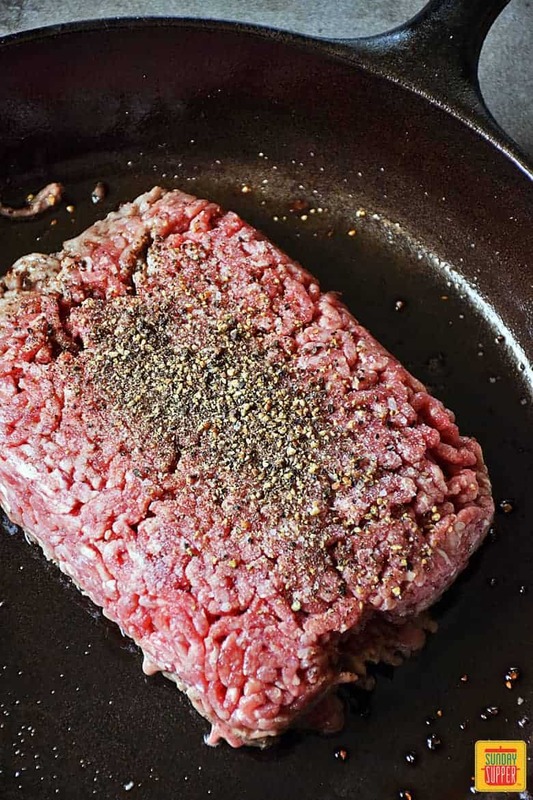 Avoid using a non-stick skillet as you won’t get a good sear on the beef. 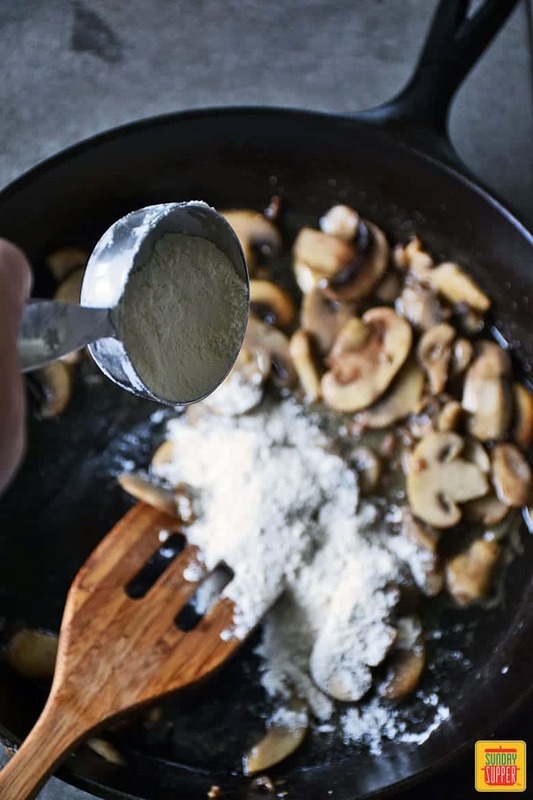 Use fresh mushrooms for maximum flavor. No canned soup or jarred or canned mushrooms in this recipe! 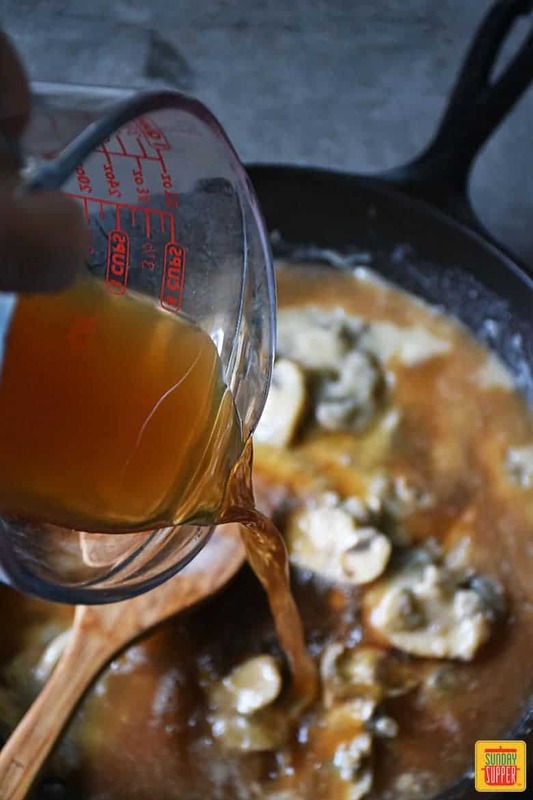 Beef stock will produce a deeper flavor, so we recommend using stock over broth when possible. Here at Sunday Supper we are passionate about encouraging families to gather together around the family table. After all, families that eat together make lasting memories and grow closer by breaking bread and sharing stories. 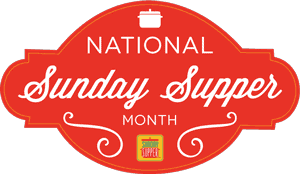 We would love for you to join us in our mission to bring back Sunday Supper by taking the Sunday Supper Month Pledge. Sunday Supper starts off as one day a week and soon becomes a way of life. 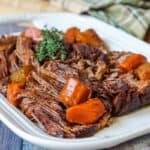 January is National Sunday Supper Month with National Sunday Supper Day on January 14th, 2018. (It’s always the second Sunday in January.) We LOVE to see your Sunday Supper photos, so be sure to take lots of photos and show us your Sunday Supper on Instagram! Tag @SundaySupperfam and #SundaySupper so we don’t miss a single one! 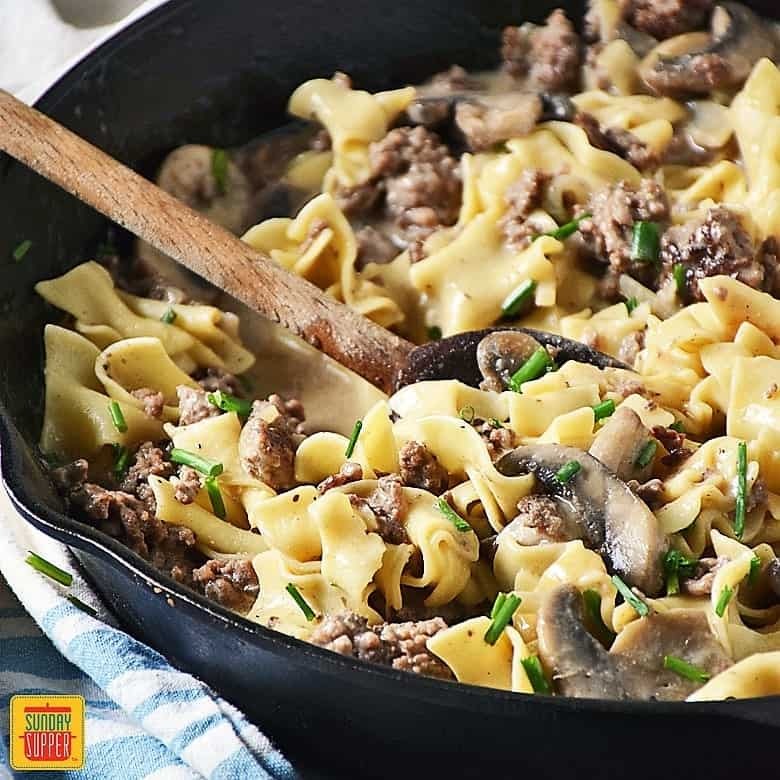 Ground Beef Stroganoff is a budget-friendly twist on the classic, substituting ground beef in place of the more traditional tender beef strips you'd find in the classic Russian recipe. 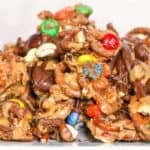 Ready in just 30 minutes, this easy recipe will be a family fave! Bring skillet mixture to a boil and boil for about a minute. Garnish with freshly chopped chives or parsley and enjoy! 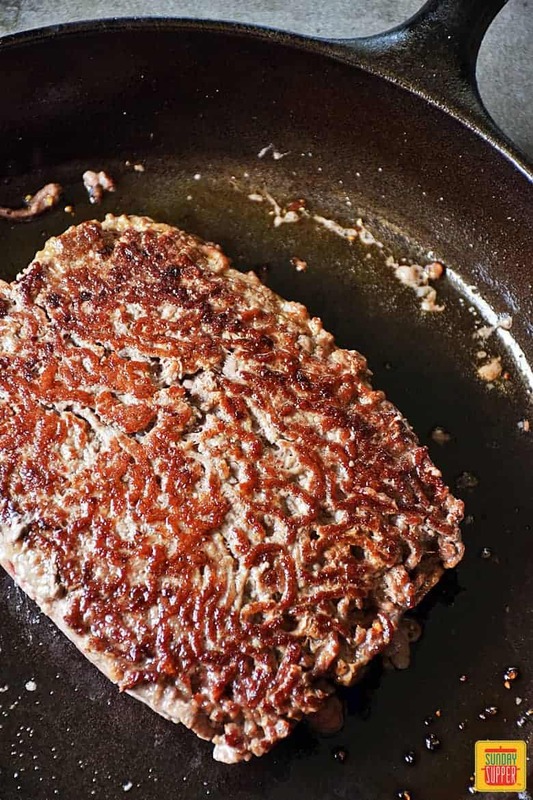 If using a well-seasoned cast iron skillet there is no need to spray with cooking spray. We recommend Certified Angus Beef® brand for the best results. Add 1 teaspoon freshly minced garlic, 1/2 cup sliced onions, & 1 teaspoon fresh thyme leaves. Bring skillet mixture to a boil for about a minute. Garnish with freshly chopped chives or parsley & enjoy! 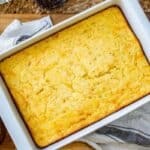 Marion is the founder of Life Tastes Good, a food blog where she shares all of her favorite recipes. 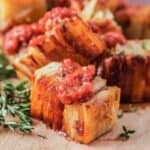 Marion hopes to inspire you to get in the kitchen and cook with fresh ingredients to experience great new flavors while saving time and money too! 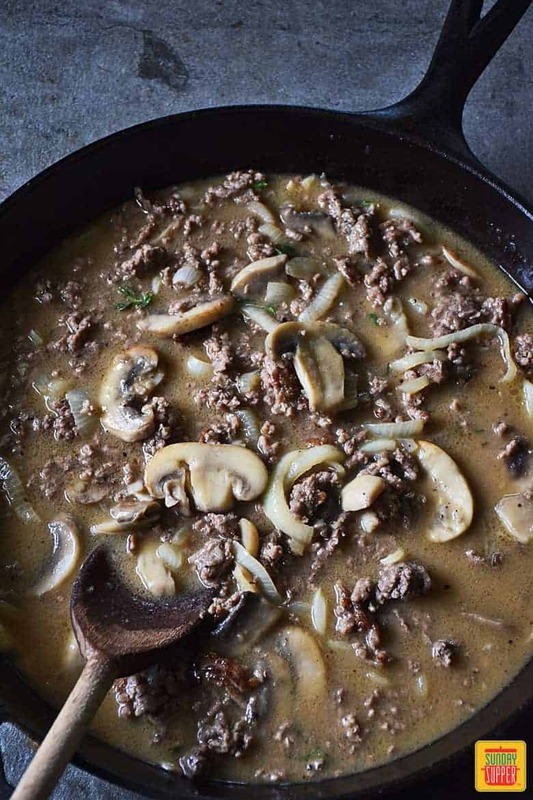 Mom mom used to always make her stroganoff with ground beef, so I DO love this version! Though mine has never looked this good!!! Happy National #SundaySupper month. 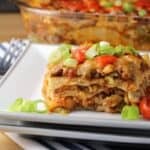 This is the perfect recipe for a family celebration around the table! 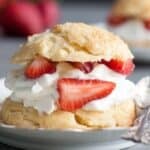 So delicious but so easy to make! All these comforting recipes this week!!! I love your method of browning the beef. Perfect, quick and delicious dinner!!! 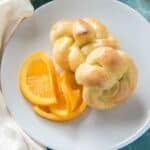 This is really the perfect Sunday supper recipe! Love it.